Enjoy country living on this very private and picturesque 6.47 acre property. You will appreciate the custom wood inside and out of this lodge style home. The first floor is adorned with cypress walls and ceilings. The 1st floor offers 10' ceilings, a bedroom, full bath, kitchen, huge utility room/hobby room, and heated and cooled garage that could be an additional bedroom. The 2nd floor offers a great open concept with bedroom, family room, and kitchenette, and private bath. This home offers two entrances so is well suited to serving your in-laws or other family members. There is a dreamy screened porch with wood burning stove with a view of a beautiful pond. You will also appreciate the open deck. Lots of entertainment space here.Attached to the home is a workshop and 3 large carports (14x24 each). Also on the property is a green house (15x23) that could be converted into a barn, a pump house (10x10), a shed (12x20) and several lean to's. Upgrades include: Outdoor stone fire pit, surround sound, security system, water softener, 9 zone sprinkler system, 2 wells, 2 septics, and 2 200 AMP electrical panels. Metal roof and termite bond for peace of mind. Fully fenced with gate. 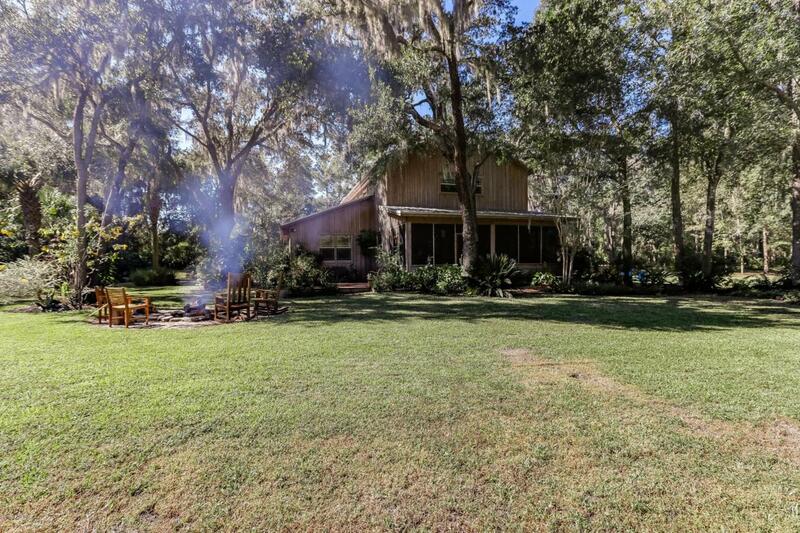 The property is mostly cleared and dotted with oaks draped in spanish moss and mature palms and backs to Moccasin Branch Creek which offers great fishing. There is a 50 AMP spa outlet and water, sewer, and electric hook up for an RV as well. Listing courtesy of Remax Leading Edge.